(Stamp of success Part 6 of 6) Is there enough evidence of ‘stamping’ by sires to factor it into our breeding considerations? Yes, there are attributes that show up often enough and strongly enough to indicate “genes at work”. This doesn’t mean it will come from the sire to the foal every time. Nor does it overshadow the contribution of the mare, the upbringing and other environmental factors. However it is worth putting into the mix. How can we breeders find out more? Nothing beats seeing a sire in the flesh – and seeing a large number of his progeny in the flesh. So breeders need visit the sires they are interested in and also encourage the studs to continue to have open days. Yearling sales are a great way to see a whole lot of a sire’s progeny at the same stage of development and pick out any distinctive ‘looks’. Luckily breeders can now get age-related foals/starters and starters/winners statistics from here and overseas which can provide insights about a sire’s ability to leave early types. We can also find articles written about many of the sires during their racing or when they retired that can highlight quirks of temperament or physique. At yearling sales time, major buyers tap the experience of those who handle a lot of horses to get the advice that will help them make better decisions. There is no reason why breeders can’t do the same at breeding time. Talking to trainers, breeders and those who break in young horses (particular those who deal with larger numbers) can help us get an insight into what sort of foals a sire might be leaving. However be aware of how quickly myths and opinions based on handling one or two horses can gather momentum. Sundon (“they’re all mad”) was too good a sire to let that stop him. Mach Three (“gutless under pressure”) is the latest if you believe some of the Race Café dwellers (but who does). There’s heaps of room for more qualitative research on ‘stamping’. It’s not about rating sires against each other or spreading rumours that can ruin a sire’s career. It’s about identifying what qualities a sire might add to our mix – and therefore help us beat the odds. (Stamp of success Part 5 of 6) Like Andrew Grierson, Sandy Yarndley warns about blaming or crediting too much about temperament on the sire. “Temperament of a foal is often more influenced by the people who handle it,” he says. Sandy Yarndley has seen a vast number of foals born, raised and sold as yearlings. He knows that breeding isn’t a cookie cutter business. You get the feeling from his smile that the unpredictable nature of breeding is something he doesn’t mind. Bettors Delight is a smaller (15.1 hand) stallion, but like Courage Under Fire’s reputation for heart and gait, Bettor’s Delight offsets any size concerns with a growing reputation for leaving progeny with soundness and speed. “New Zealand breeders have to get out of the mentality that a small horse is no good,” he says. Andrew Grierson points out that temperament is both a genotype and phenotype characteristic (governed by genes but also developed by interaction with environmental factors). So if a mare has a nervy temperament and the foal spends much of its formative months with the mare, she is likely to be more of an influence on the foal’s temperament than the sire’s genes. (Stamp of success Part 3 of 6) When I ask Graeme Henley of Alabar Stud, which New Zealand sire is most known for ‘stamping’ his foals, he hardly hesitates before citing Christian Cullen’s colour and head as one of the best examples. A “Christian Cullen type”, bay, big and bold, with that head, is likely to add tens of thousands onto a price in the sales ring compared to a yearling less obviously stamped by his sire. Buyers will see these physical attributes as a hopeful sign that the sire has also passed on his less visible qualities (heart, talent, strength and speed). Graeme Henley believes breeders are becoming more aware of what qualities and attributes different lines offer, and why some lines that didn’t fire here before with our mares (such as Abercrombie with his reputation for heart and temperament, and Western Hanover line for speed and gait) but may click better with the pool of mares we have now. It’s clear the mare still has a say in all of this! Bob McArdle believes a key factor in Falcon Seelster’s success was his gait. “You can see that in many of his foals – they are designed to get yardage in their gait.” It’s a case where the overall size of the progeny is less important than their ability to get maximum speed and reach. 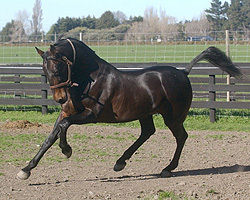 The same could be said about Courage Under Fire, where his reputation for leaving a high percentage of foals with naturally good gait gives him an advantage – “gait speed” (excuse the pun) – that offsets the size of many of his foals. Bob McArdle also sees Falcon Seelster ‘stamping’ his progeny with the distinctive “Falcon head”, and soundness. Soundness, whether from good genetic bone density or less wear and tear thanks to an excellent conformation and gait, is a hugely valuable asset to pass on to foals. No wonder that old adage “Breed the best to the best” seems unhelpful these days. The top echelon of sires available to New Zealand breeders are all superb racehorses and from strong sire lines and often famous maternal families, and many of them have a long list of successful offspring. Breeders are spoilt for choice. So I find myself feeling a bit sorry for the stud marketing teams. Apart from his specific pedigree, what is the difference between this fast, beautifully bred, great gaited champion and the next one? In situations like that, points of difference are important. Just being a “new” product doesn’t work – in fact it can be a handicap, unproven. That’s why I’m surprised we don’t hear more from the studs about a sire’s type and temperament. Some observations (even research) on physical or character qualities that are consistently showing up in his foals would be great. Until recently, we had to search hard to find the height of stallions in the stud booklets. We might be lucky to get a quote from an excited USA driver or a Kiwi trainer who has broken in a couple of a sire’s first yearlings. Of course the glossy photos and marketing hype is more about stud farm branding, and less about helping us make careful breeding decisions. That’s the tough commercial world they exist in. It’s also safer for sire promoters to focus on past deeds and proven progeny – lists of success updated each year. Nothing much fresh or insightful to help us on type and temperament. So it is up to us breeders to ask if we want to know more. As a breeder I want to know what observable characteristics (size, conformation, gait, temperament, attitude and character, colour or markings, and perhaps natural talents and soundness) might be more predictably passed on by a certain sire. If I can learn that, I may have more chance of adding in the physical or mental ingredient I need to improve my mare or deliver the market’s “$100,000 horse” on sales day. So do some stallions ‘stamp’ their progeny more than others? And if so, what do they stamp? I took advantage of the North Island Standardbred Breeders Stallion Expo at Alexander Park in 2010 to ask some of our most experienced breeders and stud representatives if they could help answer that question. These were just informal observations of their “stamp collections”, but it gave me a glimpse of what we can find out if we want to factor a sire’s type and temperament into the breeding equation. Check out the next four blogs for comments from Bob McArdle, Graeme Henley, Andrew Grierson and Sandy Yarndley on this topic.